There are parents out there that enjoy their running, but sometimes put it off. In some cases, this is because there is no babysitter. While others have tried to take their child, but only to fail with their standard stroller. Your average stroller has smaller wheels, making it harder to control while running. The smaller wheels are also tough to navigate through gravel or dirt in areas people choose to run. This is where running strollers can come in handy, having one can alleviate the stress of planning around having a babysitter. In order to suit the needs of the consumer, stroller manufacturers have developed strollers intended for use when running. With the wide variety of choices available to you on the market, choosing one can seem overwhelming. Running strollers have many more options to choose from, where everyday strollers have fewer, making those strollers less complicated to choose from. Reviews such as this one can be beneficial to you the consumer, arming you with knowledge before your purchase. The first running stroller we come to on our list, will have us taking a look at a more multi-purpose stroller option. This is great for those who don't have the money or space for more than one stroller. Use this stroller while shopping in the mall, or while getting your daily run in. This stroller can be consider multi-purpose, this is due to one simple option, the front wheel can be locked in place while running. You can also unlock the front wheel, which allows for better steering while walking. Making this stroller optimal for all your stroller needs. This stroller come with a padded seat, to keep your child comfortable while in the stroller. One feature with the seat that you will enjoy, is the five point harness, this will ensure that your child stays secured in the stroller at all times. This stroller packs plenty of benefits, while being lower in cost than some of the other strollers on the market. Don't let that lower cost fool you, this running stroller is just as top notch as the more expensive choices on the market. Another great option when it comes to an all-in-one stroller. 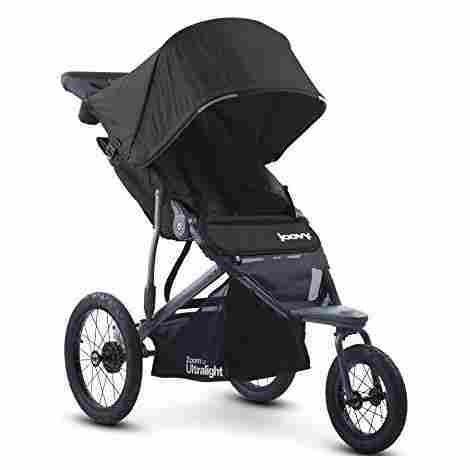 This running stroller is one of the most durable and dependable options time and time again. With an easy to operate folding system, this stroller can be toted along where ever you go. 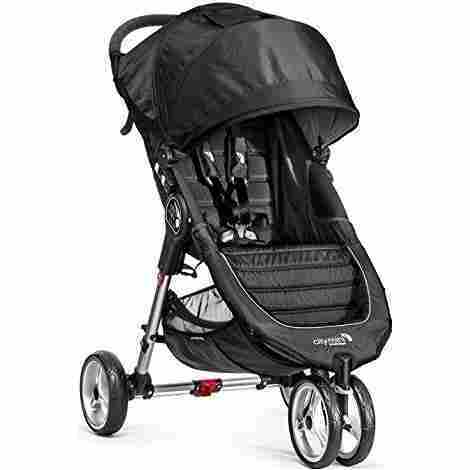 For your child's protection, this running stroller comes equipped with a canopy. The canopy is just the right size to combat the wind, rain and sun all at the same time. You can control the amount of coverage you child needs, or completely close the canopy when it isn't needed. Although this stroller does sell most of it's cup holders and trays separately, it does offer you storage underneath the seat. As well has having three storage pockets located on the stroller, you can surely pack all the supplies you need for the day. This stroller comes at a higher cost, but can be used for longer that most of the others on the market. Eliminating the costly task of having to change strollers with your child's growth. Would you rather spend more now, or continue to spend as your child grows? For running over smoother surfaces, this running stroller with smaller wheels will suit your needs just fine. The smaller wheel size makes this stroller a more compatible companion for traveling than some of the strollers with bigger wheels. This running stroller will fold to a smaller size than most, making it easier to find room for. With the pull of a single strap, this running stroller will collapse for storage. The smaller wheels make this stroller less bulky than some of the other running strollers available. Making it easier to transport this stroller even in smaller sized vehicles. You can use this stroller with your infant, by choosing to purchase the car seat adapter available on the market. The adapter will accommodate most car seat brands, taking the weight out of your hands. You can set your infant car seat into the stroller, for easier shopping, as you won't have to carry the car seat. This running stroller has the potential to alleviate the burden of lugging around that infant seat. It folds so easily, making it compact for all of your on the go needs. A low maintenance option, this running stroller is easy to clean. Making those spills or mud come off with ease. You can rest assured that your child will sleep like a rock during your nap time run. Wipe away spills and mud with a damp cloth easily. The materials used on the frame and to make the padded seat, make for quick cleanup. No need to use harsh cleaners or to take apart the entire stroller just to get the fabric off to wash. The wheels used for this stroller are made from rubber, and filled with air. Providing your child with the smoothest ride possible, even over rougher terrain. Some parents have said that even their light sleepers remained asleep during their run. An easy to maintain stroller that comes at an affordable price, that sounds like a dream. Well it definitely is a reality, as this stroller really does exsist, and would make a good addition to your family. Next on this list, is a running stroller built to handle even rough terrain. Lightweight materials used to make the frame, gives you even more control over the stroller while in use. 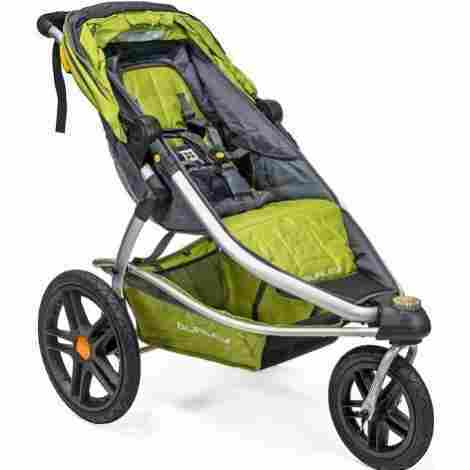 You can maximize your trail running time with this running stroller. The frame is constructed from aluminum, making it lighter in weight than some of the other running stroller options. Since this stroller has a lighter weight frame, it makes it easier to control while your on the move. For a smoother, less stressful ride for your child, this stroller has two different sized wheels. The front, which can be locked while running, is a 12 inch wheel. While both of the rear wheels are 16 inches, this is what allows you to navigate those trails for a run. As one of the lower priced options on the list, this stroller will carry your child over the trails time and time again. Made to be lightweight and dependable, this stroller has the potential to stand out among the rest. This one is a running stroller that truly has your child's experience in mind. The seat has been reconstructed, making for a better ride for your child. Changes to the frame and suspension system, provide a smooth more enjoyable time as well. The seat for this stroller has been upgraded to sit higher than most strollers, which allows your child to see more. Keeping them entertained for longer, we all know this makes both you and your child happy. With the upgrade to the seat, come an upgrade to the weight restriction. This stroller now holds up to 75 pounds, meaning you can use it for longer. The manufacturer has also made changes tho the suspension of the stroller as well. With now having a straight axle in the back, the bumps and lumps in the road are better absorbed by the suspension. Making for a better all around running experience. For an overall improved run, this stroller has many potential benefits to both you and your child. Since the cost is lower than some of the other stroller choices, why not treat yourself? This option for a running stroller has some amenities for you, the parent as well as your child. 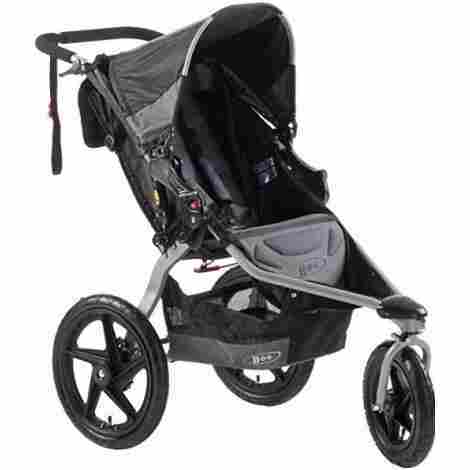 You have the capacity to run in the most comfortable position with a stroller such as this. For your comfort, the handle of this stroller has been designed to be adjustable. Meaning that you can run with better posture, as this handle has several height adjustments. The handle is also covered in a padding material that can easily be wiped clean, for a softer grip. The seat for this stroller not only fully reclines, it also has a vent to allow airflow. This will help to keep your child cool, while staying covered by the canopy. For your piece of mind, the canopy also has a window so that you can sneak a peek of your child. Lets face it, most running strollers won't come at a low price. If you're going to spend more, why not pick a running stroller that has your comfort in mind as well? This running stroller offers a multitude of benefits to both you and your child. Amenities for comfort for your child, while the key features adjust with the turn of a knob or touch of your foot. Making using this running stroller simple and efficient. With a simple touch of your foot, you have to ability to change the suspension setting. This allows you to adjust according to your pace and the terrain you will be traveling. Which in turn makes for a smoother ride and better control over the stroller. Incorporated into the handle are controls for locking the front wheel, which is great for being able to keep your pace. Another great feature found on the handle is the parking brake, which is normally set with your foot. Having it within hands distance can make for quick setting when necessary. Although this running stroller is more costly, there are more than enough safety and comfort features to make that cost seem minimal. Hand and foot controls make using this stroller while on the move a breeze. This running stroller offers something more unique, that not many other strollers on the market have. Making it optimal for all your running needs, including for running errands. For those who like the idea of going "green" this stroller also has the potential to assist you with that. This stroller offers you the ability to change the front tire lock position. You can lock the wheel completely, for those faster paced runs. Set it to partly swivel, which works best for jogging, as you can still turn the stroller. Lastly, you can opt to have the wheel unlocked, for your casual stroll around town. The seat fabric is made from recycled plastic, which we all know is good for the environment. You will find that the fabric has been certified as being made from fully recycled materials. With one of the most unique features available, this running stroller gives you capabilities that others on the market just don't have. Made from recycled plastic, this manufacturer makes an effort to do it's part for our environment. Our last running stroller on the list offers the user added safety features, along with a special seat design. The design of the seat is said to make getting your child in and out a breeze. The technology incorporated into the design of the seat gives you the benefit of non tangling buckles. This makes it easier to both put your child into and remove your child from the stroller. If you have ever dealt with tangled straps, you will find this feature amazing. This manufacturer has decided to color all the places you need to access the brakes, folding the stroller and more in yellow. This ensures you ease of use, and the satisfaction that you can't accidentally fold the stroller. This is a benefit to both you and your child. Good quality comes with a higher price tag, this is true in this case as well. 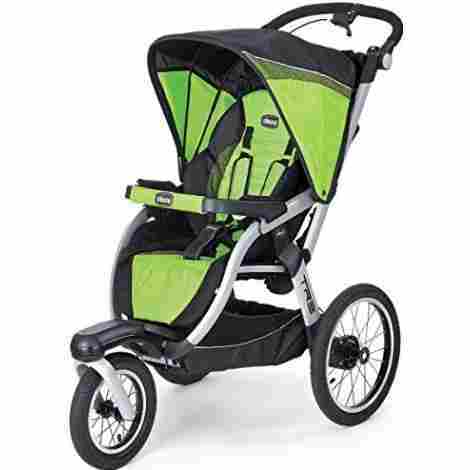 For a more durable choice in a running stroller, this one definitely has what you need in that area. After going over the reviews for each running stroller on our list, you should feel as though you are more informed than when you started. 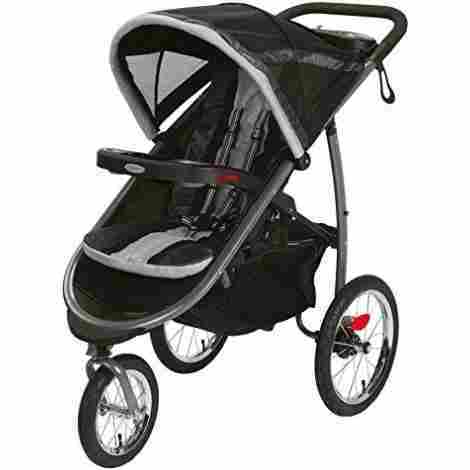 Keep in mind, everyone’s needs for a running stroller will differ, but opinions from others can also be beneficial. Those who run with their children often will have a good idea for which brand might be better. Consider the terrain you will be running on, this can help you decide which size wheels will benefit you the most. 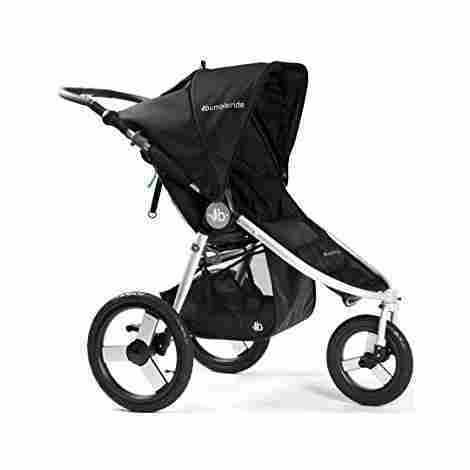 The safety of your child is one of the most important aspects of choosing a running stroller. So be sure to look for a stroller that has a high rating in safety. Once you have found one that suits your needs the best, get out there and put some miles on. If you have ever tried running with the standard style stroller, you know that this can be a hassle. That is because of the wheels and lack of suspension. Normal strollers will need a more smooth obstacle-free path for travel. When attempting to use a standard stroller for running, your child will most likely be exposed to a lot of unnecessary jostling. Which can make for a cranky child, but who could blame them. A running stroller has bigger wheels, with a suspension designed to absorb shock. This makes for a much smoother ride for both you and your child. You can choose a front tire that stays in place, which is best for running. If you’re looking for a more multi-purpose stroller, look for one that has the ability to lock and swivel. This allows you to lock the front tire while going for a run. You can also unlock the tire, this will allow the tire to swivel, making it easier for walking. A true running stroller will set the front tire far enough forward, to provide your child with the smoothest ride possible. It is best to look for a running stroller that has tires that are air-filled, these tires provide the smoothest performance. One disadvantage to air-filled tires, you will have to check the air pressure often. This will keep your stroller functioning properly and your child’s ride smooth. Be sure to check the instruction manual for the amount of pressure the tires should have. This number in some instances will vary from what is marked on the actual tire. For better ease of storage, look for a stroller that the tires can easily be removed. Just be sure after storing, that the tires are reinstalled correctly to avoid any injury. The safety of your child is one of the most important factors when choosing a running stroller. Look for one that has a good sturdy buckling system. The best option for this is the five-point harness, this will ensure your child stays secured in the event that the stroller tips. Another great feature that some running strollers will have is a strap for you to wear around your wrist. This eliminates the chance that your stroller can get away from you. This may seem silly, but accidents happen, you could easily trip and fall. Then what happens, your stroller is on the loose, this strap keeps that from happening. The brakes of the stroller also play an important role in the safety of your child. There are two different types of brakes that can be found on a running stroller. The first, a hand brake, this also might seem silly to someone who lives in an area that is relatively flat. For those that run in areas that are loaded with hills, a handbrake can help you slow the stroller. The second, a parking brake, this keeps the stroller motionless while at a standstill. Making sure that your stroller won’t become a runaway. To keep your child happy, look for a stroller that has a canopy, this keeps your child safe from the elements. A canopy will provide cover from the sun, wind, and rain. If your worried that you won’t be able to see your child under a canopy, look for one that has a window. The window will give you the opportunity to peek at your child from time to time. For those with younger children, a seat that can be adjusted to recline comes in handy for napping. Some of the adjustable seats will come with several options to set the seat at. Your comfort while using this stroller is as equally important as your child’s. Consider a stroller with storage capacity, this is normally found under the seat of the stroller. Having storage in the stroller will lighten your load considerably, which maximizes your running performance. A stroller with cup holders in the handle is a great feature to have. This allows you to carry water for both you and your child. Check that the depth of your cup holders is adequate, this will prevent the drinks you are carrying from bouncing out. When it comes to being able to fold your stroller, look for one that can do so easily. Otherwise, your stroller won’t be as practical as you want it to be. For example, a stroller that is difficult to fold, and then set back up won’t be as easy to pack for a trip. If you find one that folds and sets up rather smoothly, you are more likely to travel with that stroller. The amount of space you have for storage will also affect which stroller you should choose. For smaller storage areas, a stroller that folds more than one time might be more practical. Adjustable tracking allows you to keep the front tire of the stroller under control. Meaning that in the event your stroller tends to move more to the right or left you can correct this issue. Simply adjust the tracking per the manufacturer’s instructions, to keep your stroller headed straight down the path. Q: What wheel size is best for a running Stroller? 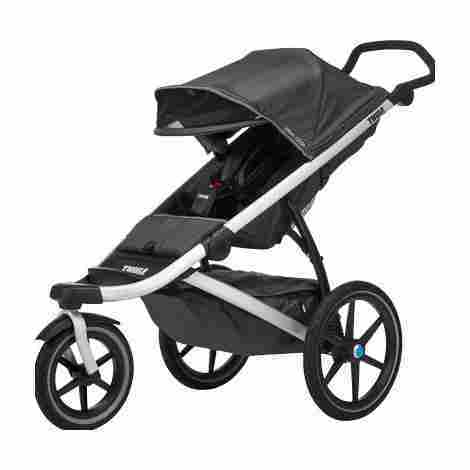 A: For best results, while running, look for a stroller that has at least a 12-inch wheel. This will make for a smoother ride over the pavement for your child. If you intend to run over slightly rougher terrain, such as a trail, look for a stroller with a wheel size of at least 16 inches. The increase in size will make it easier to navigate the trail while giving your child a more comfortable experience. Q: How old should my child be before I take them running with me? A: It is always best to check with your pediatrician for the answer to this question. For a quick reference, children six months old, in good physical health can handle shorter runs over smooth surfaces. For running longer, or over trails, your child should be at least 1 year old. Q: Do I need a running stroller that allows the front wheel to swivel? A: If you wish to only use the stroller for running purposes, then getting one with a fixed front wheel will be fine. 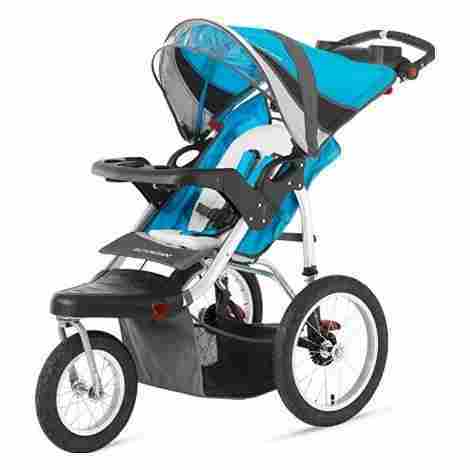 As having the wheel locked into place during your run is best, this provides safety and better control of the stroller. The strollers that allow you to choose from either a fixed front wheel or allowing the front wheel to swivel, are typically used as multi-purpose strollers. Allowing the front wheel to pivot in motion makes the stroller easier to steer while shopping and running errands. Q: Is it safe to use a running stroller? A: It is safer to use a running stroller as compared to a standard stroller. 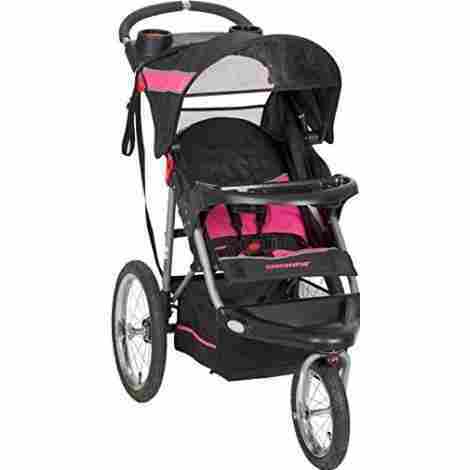 Running strollers have been designed with your child’s safety and comfort in mind. They have harnesses, bigger tires, and a good suspension system in place, this keeps your child secure while giving you peace of mind.